Little House Home Arts: "To Life!!" I have been reading a wonderful book, To Life by Harold Kushner.This is a book about being Jewish and although I am not, it has gotten me into thinking about, and appreciating my own faith and its roots as well as the many stories and spirits of my ancestors. Rabii Kushner talks about how empowering and enabling it is to embrace one's collective faith and family, culture and past. I am in process of doing just that. 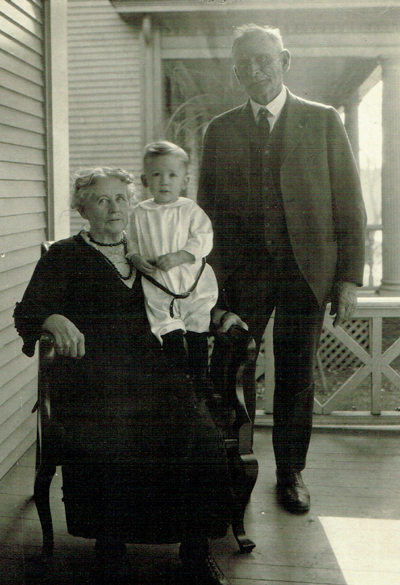 My dad with his grandmother & grandfather, who fought in the Civil War. It started some time ago when I discovered that my great grandfather had fought in the Civil War under General Custer and spent the best part of a year in various prison camps, including the Confederate Prisoner-of-War-Camp in Andersonville, Georgia, where so many died of disease, starvation and exposure. I can't help but think how courageous, tenacious, and tough my grandfather had to be to persevere and survive this war! 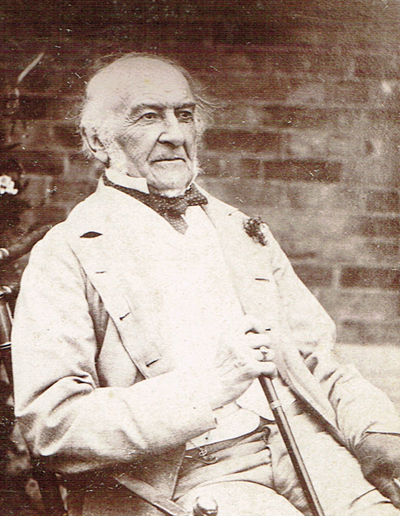 His wife, my great grandmother was no wuss either. She had been a prize-winning trick bare-back rider in her earlier days! Years ago I picked up a book about the Amish customs and sayings, and returned home to have a serious visit with my aging mother. Within the pages of this book were not only, my mother's most frequently used quotes, but my mother's idiosyncrasies. It was as though I was reading a book all about her, and indeed I was. 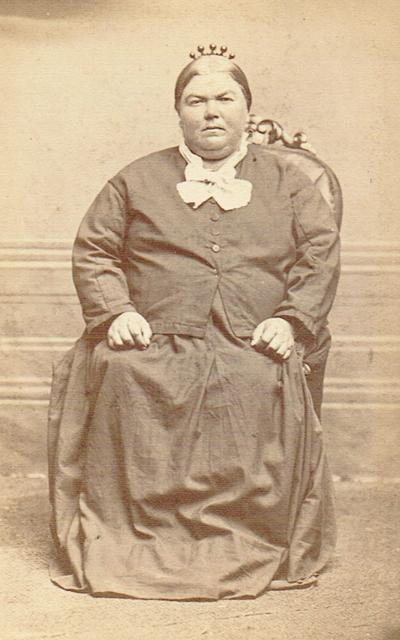 Her family all came from the Pennsylvania Dutch culture of Lancaster County. I have since become friends with a woman who is somewhat younger than my mother whose family also came from this same region. We laughed and compared notes about our customs: suppressed outward expression of emotions, blended with a strong independent spirit of living their faith with practical knowledge that "God helps those who help themselves" resonated with us both. My mother's grandparents worked hard to teach their children to be "industrious, frugal, honest, and pious" through their "own example of living right". These values taught to my mother by her mother, made her very practical, hard-working and strong! 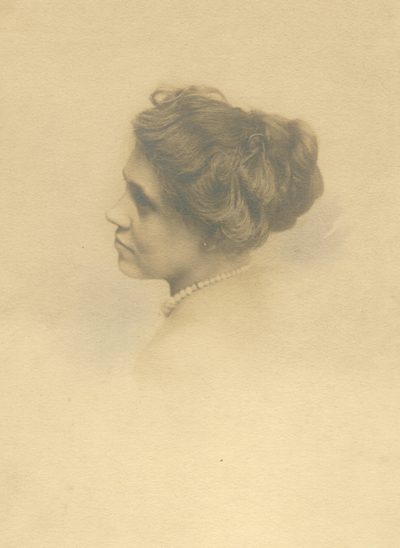 She took pride in doing whatever she did with much care and diligence, and saw to it that her children did the same! 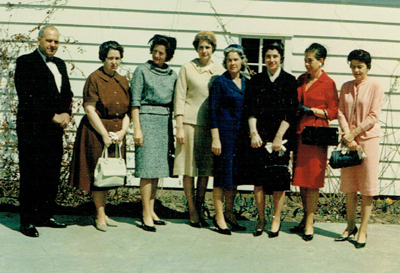 My mother, dressed in black, with her six sisters and one brother. My mother was raised on a farm in Nebraska during the infamous Dust Bowl Days and shared with her children story after story about her rural upbringing with her many siblings. Being from a poor family during these tough times when many went hungry, they learned to be creative and resourceful, and take pleasure in the simple things of life. Picnic suppers taken to their cow pastures was great fun for her and her sisters along with enjoying pink kitties that were born in the barn where the mother cat had given birth to them where the powdered red barn paint was stored. My mother also told about jumping out of a hay loft and breaking her nose, but her and her sister lying about it to her parents, lest they get into trouble for being where they weren't supposed to be. Another fun story was about my favorite aunt getting very excited to find that her grandmother was at her house early in the morning with a store bought cookie tin. She was told to wake her sisters and get dressed and then come down for a surprise. She was sad to learn that the surprise was another sister, instead of store-bought cookies! The tin was simply a safe and clean container to store what was needed for a home birth. 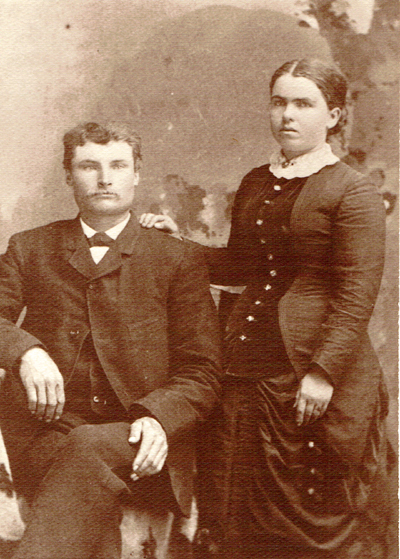 My grandmother's parents. "Education and good character all important"! My mother was very close to her next older sister. There was only one year age difference between them and everyone had thought this sister was their mother's favorite as she got to go everywhere with their mother. They all were shocked to learn later that this was her mother's very intelligent way of keeping her sister from leading my mother and her other sisters into mischief, as she did without her mother's careful eye! 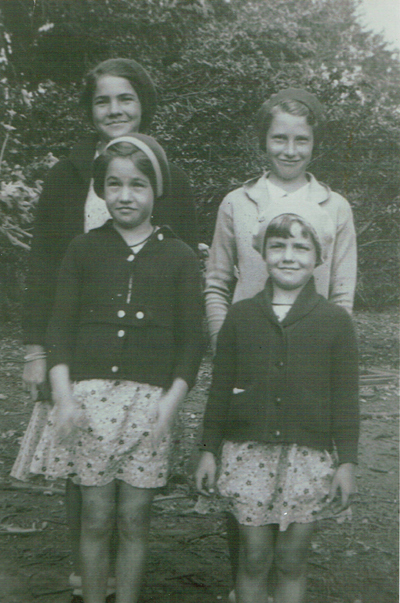 My mother (light colored jacket), her next older and two younger sisters. All of these stories added to my own childhood adventures in Denver, Colorado, where our living was still quite rural. Collectively we joined water hoses together to stick in a prairie dog hole, hopeful of flushing one out and into a box placed over another hole. Their front and back doors were not so easy to figure out however! Catching crawdads and garter snakes was definitely easier. 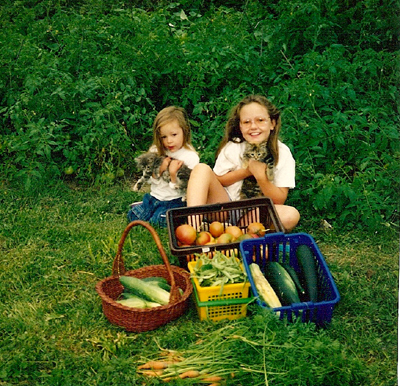 My kids, living on a farm in Vermont with gardens, hay lofts, and kittens. I think all these rural stories influenced me to embrace the opportunity of living on a rented farm in rural Vermont with our children. I remember sitting in our farm-sized tomato garden, weeding it and looking out over the rolling hills of this three hundred acre farm, with view of its apple orchard and nearby woodland and never feeling richer in my life. My kids re-lived my mother's upbringing on this farm, keeping secrets from me until we no longer lived there. Howling to attract the coyotes and climbing high into the hay loft would have been cause enough for me to return to Denver from where we came. They were living out my dreams of being raised on a farm just as my mother and her sisters! My mother's mother, my grandmother, college educated. My mother's mother kept journals recording the day to day activities of her life and I am privileged enough to have a computer copy of several of them. 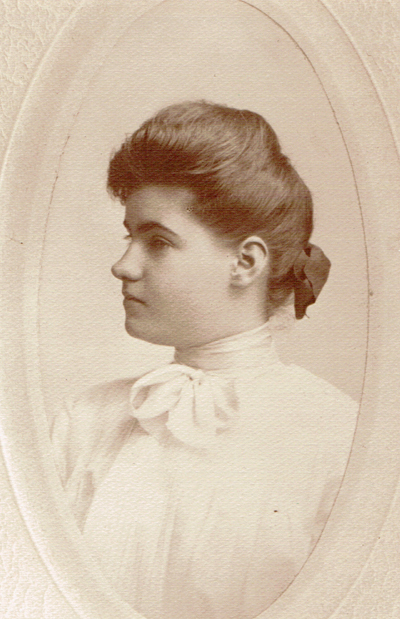 Her father "believed in the merits of an adequate education" even for his daughter, rare in her day and her diaries are well written historical logs of her life. I have been told they are valuable pieces of history that are deserving of publishing. 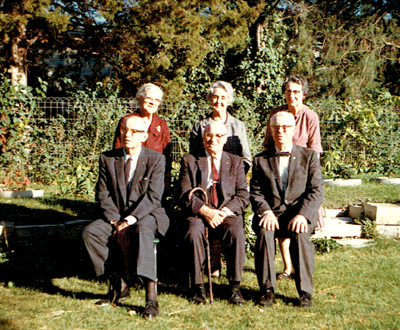 They read like Little House on the Prairie and tell about raising her seven daughters and one son with her husband on their farm in Hickman, Nebraska. 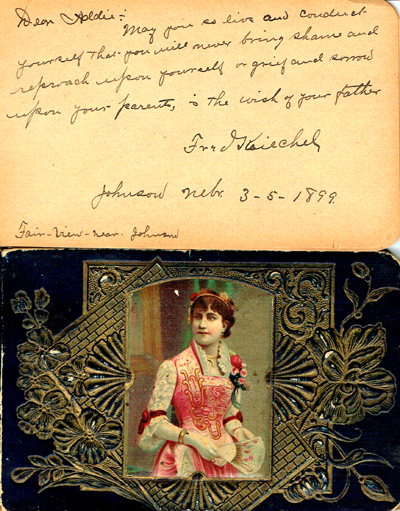 A too serious message to my grandmother by her father in her autograph book! 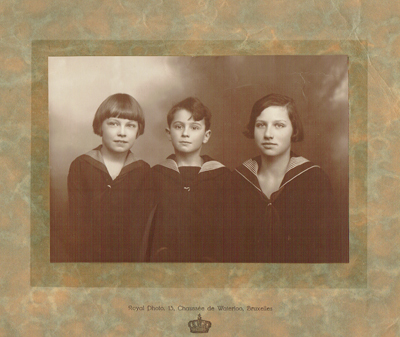 My grandmother's three brothers, "universally respected, admired and loved". 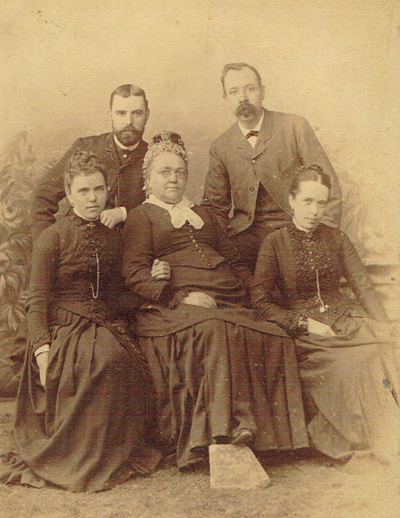 This same grandmother had three brothers by the last name of Kiechel and following in their father's footsteps, all became active leaders in their Nebraska communities "inspiring others through their honest toil and practical economy, in keeping with the essential traits of character, earning them things that money cannot purchase: universal respect, admiration, and love" (wrote their father, Fred Kiechel about his values, not specifically of his sons). One was a farmer, another a state legislator and another a county judge. I have heard it said that the judge went on to be a judge at the Nuremberg trials. I returned to Nebraska years ago to bury my parents and I received a grand tour of the region, by mom's cousin, and heard more stories, and visited ancestor's grave sites. What a privilege to be a branch of this long extended Martin/Kiechel clan! 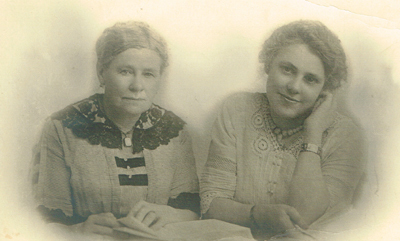 My dad's grandmother and mother, both French milliners. My dad's mother's and grandmother's French Millinery shop. My dad was never proud of pictures of himself donned in lace. I love them!! When I was small, my dad had a special box of family treasures that he had had since he was a young boy. 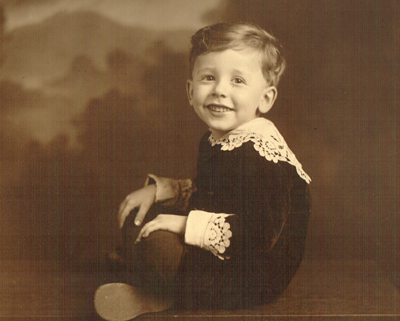 He was orphaned at the age eight or nine and was then taken to France by his maternal grandmother to live with her cousin's family, until he was later placed in a Masonic Home for Children in Fremont, Nebraska. 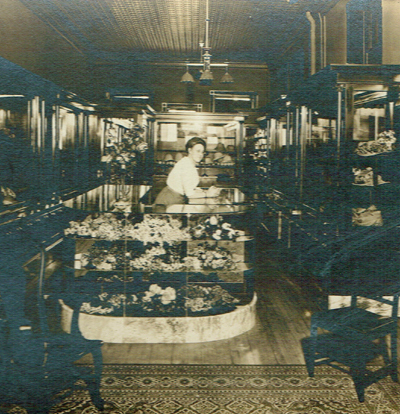 Both my grandmother and great grandmother had been French milliners with their own shop and when I was a young woman I took a trip to the Ozarks to visit a friend of my dad's mother. She gave me my Great Grandmother's silver thimble. I proudly took it home to my dad and instead of adding it to the collection of small remembrances, he gave me the little bent wooden thimble case, reuniting the thimble with its case. If I never inherited anything else, I couldn't have been happier! I now have bed sheets that she had trimmed with my grandmother's handmade hairpin lace as well. My great grandmother's thimble and case...a real treasure! My dad's mother. Sadly she died when he was but a young boy. My own mother was creative with a needle as well, going on to become a beautiful hand-quilter, having been taught by her mother as a small child. I am so proud to stand on the shoulders of these strong creative "stitchy" women and inheriti their fine legacy of sewing talents! Dad's relations that he stayed with when his grandmother took him to France. My mother received a letter from the cousin that my dad had lived with in France shortly after my dad died, and asked if I wanted to write back to them. I considered it my privilege to do so. My dad's cousin now lives in Brussels but has a daughter close to my age who lives in nearby Maine. We we have had two reunions since writing my letter to them. Listening to the stories about my dad's grandmother who was so very close to her French relatives was heartwarming, especially as I hadn't had the chance to know my grandmother or great grandmother. His cousin's family narrowly escaped the bombing in Europe during World War II with a mattress tied to the roof of their car, and the last time they had seen my father was shortly after World War II. Dad's cousin and her husband still live in Brussels, but have an apartment in Paris and their family's ancestral modest cottage on the French Riviera that she and my dad enjoyed as children. They are well traveled and enjoy various musical and theatrical events, fitting my image of "cultured European relations". I mistakenly thought that learning the French language would come easy for me, and instead must content myself speaking only English! My dreams and thoughts of far away foreign places is not as easily extinguished, however. How rich I feel with ancestors as interesting as these!! I cannot stop this reverie without talking about my musical ancestry. My mother and her two older sisters sang in a trio, that performed at funerals and other occasions in the small town in Nebraska where she and her sisters grew up. As I got to know my mother more in her later years, I learned that she sang with her father and aunt and uncle as well. She had sisters that played the piano, and a brother that played the trumpet. Her mother had played the piano and had met my grandfather when she accompanied him playing the violin. He also fiddled. 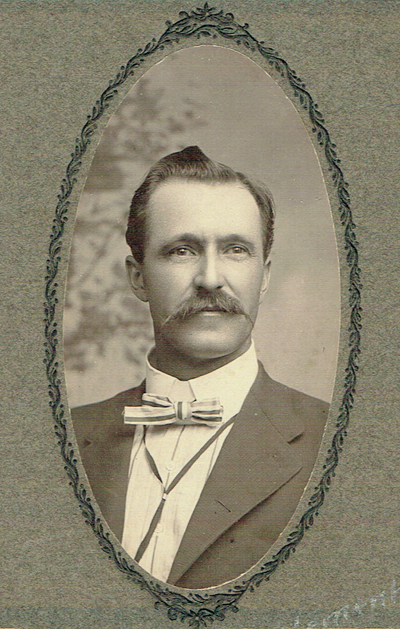 My mother's father, who played the violin and he fiddled and sang as well. 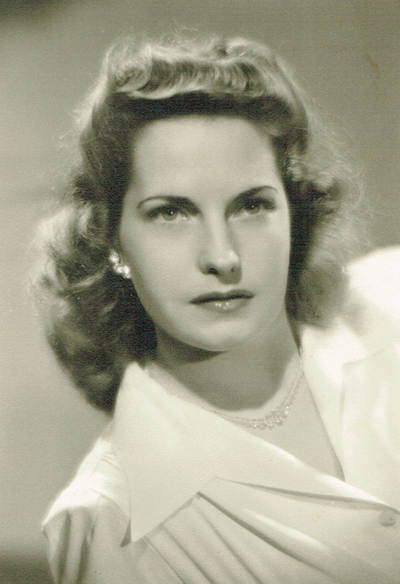 My Aunt, Ruth Martin, who sang on her own radio program in California. My mother broke up her sister trio when, instead of going to California with them, she married my father and later moved to Colorado. One of the trio "made it big" having her own radio program and singing in a well-known professional chorale group. Her daughter still has a collection of her records. Again, it seemed only natural, that I loved music, though sadly my piano lessons "never took" any more than my French, and I was limited to playing only the first line or two of most songs. It did however, earn me the right to keep the old upright piano of my childhood, the one that didn't stay in tune any more than my father, who "couldn't carry a tune in a bucket"! My love of music did take me to a local folk concert hall weekly where I met my husband who plays guitar and sings. He also played the trumpet when he was young. I tried to play the guitar as well as the piano with equal lack of success, but finally contented myself learning to play the harmonica, when my car radio broke down. Cars, showers and closets remain my only performance venues!! 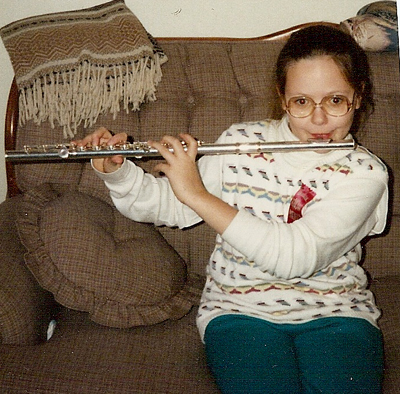 My daughter, with a music gene, played the flute all the way through school. My children did better than me in playing musical instruments. My eldest started with piano and switched to flute playing in her school and local village band. She also knows all the words to Broadway musical songs and not infrequently breaks into song and dance spontaneously performing for me on her kitchen stage, in front of the doorway next to my desk. She makes me laugh! She has participated in all sorts of musical theatrical productions, but mostly as stage, costumes, and props designer. My youngest daughter was quite the drummer, but never played in sync with the band? My husband assures me that she has great rhythm! She does, however, seem to march to the tune of a different drummer, choosing to complete her high school curriculum early in order to take college classes while still in high school! She is an apple that doesn't fall far from the tree! My dad was always a non-conformist and proudly claimed that my siblings and I were the same, along with his many grandchildren! Both my father and his father were professional engineers. My dad was a very successful business man in the construction business as Denver quickly sprawled into the city that it is today. He claimed he could solve any personal problems on his slide ruler. He was proud to follow in his father's footsteps, as he was an engineer as well and had been one of the core of engineers who built the Panama Canal! 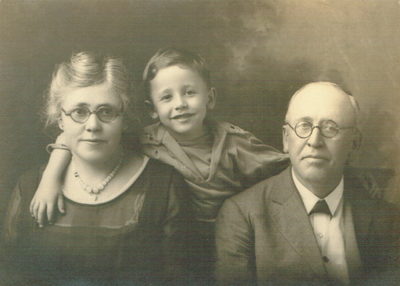 Dad with his mom and dad, an engineer who helped build the Panama Canal. So here's "to life"!! I see the genetic DNA and family values live on through each of us and I am so proud of my family history and future. Strong faith, character, determination and talent are within my gene pool and my ancestors indeed make me stand a little taller! My father did warn us however, that when he asked his grandfather why the family name was changed from Campion to Campen, he was told "to never to look too close as there might be a pig thief among his relations". She is one of my relations! Possibly of royalty judging by her crown? LOL!! My dad loved tracing our family tree and used to have great fun teasing my mother about her many cousins, claiming that she had "Call girls" in her family (spelled Kahl, though now I can't find them)! He laughed and created more names to add to her side of the family tree after finding "Friend Deahl" as one of her relations. My dad affectionately referred to him as "Friendly Deahl" and renamed his children to "I'va and Bad",....So Ancestry.com, here I come to determine what is fact and what is fiction, as well as to put some names to some of the many unlabeled ancestral pictures. I won't be surprised that reality might be stranger than fiction! Eccentric and odd seem to be what I remember about some of my relatives, though fortunately, I didn't get any of those genes!!! More relations? I am glad that this wasn't my mama! Mom thought he might be a relative from Hollywood...the nose is familiar! Labels: culture and past. Ancestors and their legacies for us., Faith and family.